Hello Fall! Yes, I know its still August, but fall truly is just around the corner and with it comes bright fall colors, changing leaves, cooler evenings, pumpkin flavored everything and of course fall weddings. The idea of a fall wedding makes me smile. Ideas float through my head of pumpkin spice cake, apple pie, pumpkin pie, jewel toned decorations in emerald, ruby, amethyst, topaz, sapphire, gold and silver, paper leaves and the smells of thanksgiving! So how does someone accomplish a fall wedding in a budget friendly way? Let me supply you Amethyst with a few tips and tricks that should help. The start to any beautiful wedding day is to choose a color theme that you love! For a fall wedding I would suggest incorporating Gold or Silver and a jewel toned fall color that you like. A wedding can be any color combination that you can dream of and as long as you stick to shades of your chosen colors, they will blend well together. You don't have to worry about them matching perfectly. I would suggest having one or two primary colors and a third color to use as accent to the main colors. Some color combination ideas would be gold, topaz and emerald or silver, ruby and sapphire. Don't let these two ideas limit you, as there are many color combinations that could be used. After choosing your color combinations the next step is to think about your invitations. Invitations set the tone of your wedding and should be chosen early in the planning process, so that decorations and coordinating signs and printed items can be designed to match. One of the best ways to save money on your invitations is to stay away from high priced invitation companies and look to smaller privately owned companies. These can be found on Etsy or in your local phonebook. 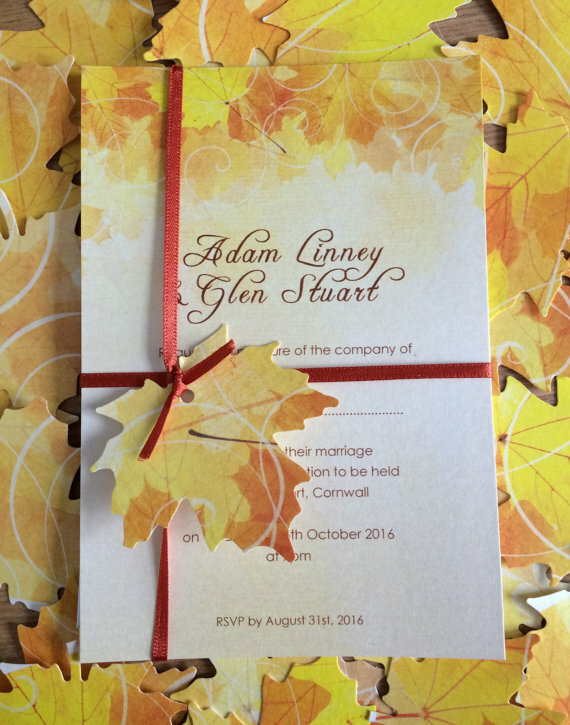 A few shops to visit on Etsy are; Pickled Egg Design, www.pickledeggdesign.etsy.com (I love her Falling Autumn Leaves Wedding Invitation Suite. ), iDesign Stationary, www.idesignstationary.etsy.com or on Zazzle (She has a beautiful square fall wedding invitation.) or my Etsy shop, www.bethannerickson.etsy.com, with my Fall Into Love wedding invitation suite. Also right now Ebates is giving 2% cash back on purchase made on Etsy. Click this link for Ebates to sign up today and save even more money on your wedding! One of the great things about invitations from Etsy is easy communication with the designer, being able to customize wording and color (on most invitations). It's wonderful to work with a small shop who truly cares about your special day and providing you with the invitation of your dreams. 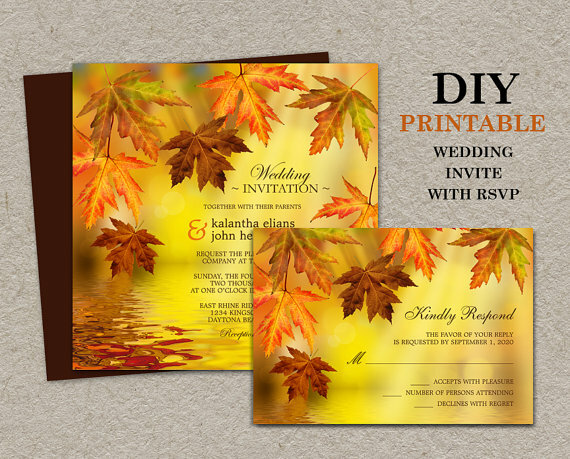 You will also save time and money by being able to order your invitations from the comfort of your home and choosing your print options, such as printing at home or through a local print shop. In most cases means you will spend less on your invitations than you would from a boutique stationary store. Now that we have the colors chosen and the invitations taken care of, its time to move on to the decorations! Decorations for your wedding don't have to be elaborate to make an impact. They can be made at home quickly and easily and still set the mood for your special day in a beautiful and simplistic way. One idea that comes to mind is, is using leaves on table tops to bring the feeling of fall and to add pops of natural fall colors. The most budget friendly way to do this is to collect leaves and coat them with Mod Podge to preserve them. (Instructions below) I would then use these preserved leaves on top of a white, sliver, gold or jewel toned table cloth, with Mason jar candle holders and a fall scented tea light. Another great addition to fall wedding décor are wood rounds (as seen here). These can be purchased from your local craft store or collected from family and friends who have fallen trees on their property. Wood rounds add height and dimension to your table tops allowing you to display candles, flower or dishes of food. Arrangements of pumpkins and gourds next to your candles will also add a wonderful fall feeling to your wedding. These can be found at local farms, grocery stores or craft stores. I could go on and on as I have many more decorating ideas. If you need more suggestions or help completing an idea you have, please feel free to contact me. Good luck with your fall wedding! Thank you for reading and be sure to check out my Etsy store at www.bethannericksondesigns.etsy.com and follow me on Facebook, Instagram and Pinterest. Step 1: Gather leaves either from the ground or straight from the tree. Select vibrantly colored leaves that are somewhat dry but not brittle. Step 2: If your leaves are still very green and moist, place them between two paper towels under a heavy book for a few days so that they dry a bit but are not brittle. If you don't need to dry them, move on to step three. Step 3: Using a foam brush to apply decoupage (Mod Podge) to one side of your leaf. Step 4: Place on newspaper to dry until it turns clear and is no longer sticky. Step 5: Turn leave over and repeat steps 3 and 4. Once both sides are done your leaves are ready to use!